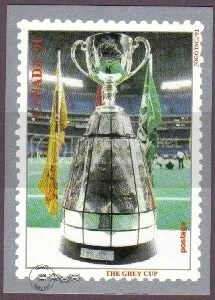 JOGO is a Canadian Football card manufacturer that started in the early 80’s with their 50-card Black & White set. I like their 1991 product because of the crazy looking guy on the front of the box. That’s Rocket Rat. The 1991 set features 220 cards and was distributed in two series. 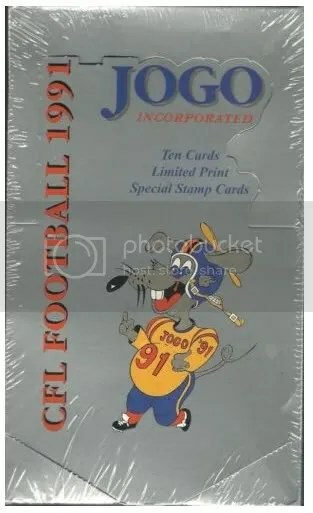 Rocket Ismail was suppose to be included within the 1991 JOGO set, but didn’t make it in because he signed an agreement with All World, another Canadian card manufacturer. I like how it states on the front of the box that its a “Limited Print”. Its not too limited considering thousands upon thousands of these sets were produced. The 3-card stamp insert set are the rarest and most valuable cards to find. By rare and most valuable, I mean they might be worth $0.99. Sealed boxes can be found for $5.00 each.